This is .223 Hornady 52gr. Boat Tail Hollow Point Ammo. 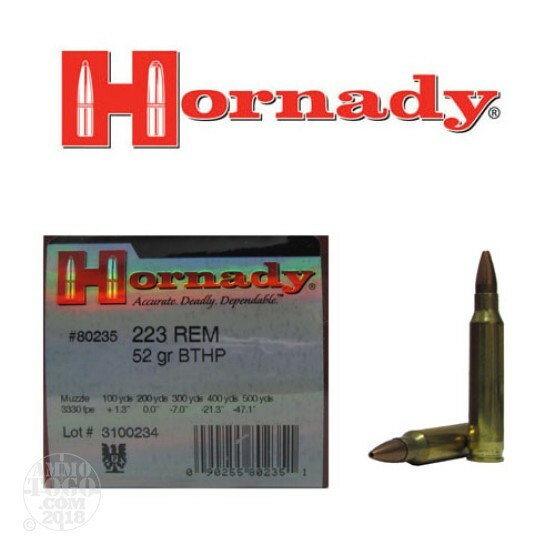 This ammo is brass cased, boxer primed and features the Hornady 52gr. BTHP copper jacketed (non-magnetic) bullet. These Hornady ammunition loads are dependable and cost effective product. This ammo has a muzzle velocity of 3,330fps and comes packed in 50rd boxes.